The thing about the Connect the Dots Tour is that it sparks the cliché statement of “it’s nothing like you’ve seen before”. However, it can’t be stressed enough how unique this tour is. Whether it’s Misterwives’ use of vibrant lighting and instrumentals or Vinyl Theatre’s near decade-long friendship shining through each song, each set is not only unique in its own right – it’s a true form of entertainment. But let’s talk about Smallpools. Although each band member hails from a different state – Mike Kamerman from New Jersey, Sean Scanlon from New York and Beau Kuther from Oregon – their journey together, along with former member Joe Intile, began in Los Angeles. Their debut single, “Dreaming”, was released in 2013 and quickly reached number 23 on the Billboard Alternative Songs chart. From there, they released their first full-length titled LOVETAP! and played alongside artists such as Walk the Moon and Twenty One Pilots. Their latest album, The Science of Letting Go, was released a month before the tour began and presents major growth in the lyricism since their last release. They mix some of these songs with their previous ones to create a set list that perfectly combines the two. From the start of “Killer Whales” to the end of “Dreaming”, Smallpools adds their own element of fun to their show that makes them the perfect addition to the Connect the Dots Tour. Each act gets creative with their lighting, which may sound like one of the more unimportant aspects of the show, but really ties everything together – and Smallpools’ set was no exception. When you’re not mesmerized by the flashes of brightness, you’re most likely having a difficult time deciding where your eyes should remain focused on. Are you watching Sean command the stage with just a microphone or a keyboard? Did you see the smile on Mike’s face as the beginning of “Passenger Side” came through the speakers? Should you keep your eyes on Beau as he crashes each cymbal louder than the next? Blink and you just might miss Dr. Blum of Misterwives make a guest appearance or Mike and Sean play the largest xylophone you’ve ever seen. These guys have tricks up their sleeves, and they make sure it’s a trick you won’t soon forget. The Connect the Dots Tour is drawing to a close, yet this is just the beginning of The Science of Letting Go. 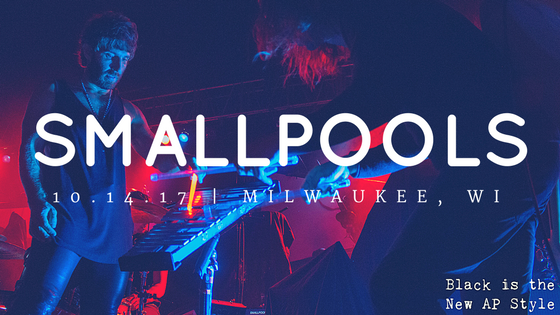 Smallpools is nothing like you’ve seen before, and Smallpools is somebody you’ll want to see over and over again.